This is a very special MP3- it can aid you in easing stress and anxiety naturally, using sound and subliminal words, set into a background of warm, ambient music, to help rebalance your mind and spirit! If you are currently taking medication, it would be unwise to stop suddenly; this mp3 is not a substitute for medication, but an additional aid, which can help you to recover your sense of balance, and lift your spirit! It has been shown that the Alpha brainwave level is beneficial for calming the mind’s anxious thoughts, and producing a sense of calm. 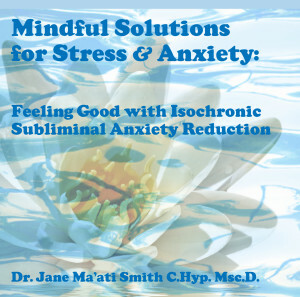 The isochronic tones on this cd can help to bring your mind safely to a meditative Alpha level, thus easing your anxious thoughts and bringing you the sense of calm and peace you deserve! Just play on regular stereo speakers. Keep in mind, there are many different factors contributing to anxiety, such as life stressors, past traumas, poor diet, allergies, and genetics. The subliminal suggestions on this MP3 will help to address some of this. Try to address some of your biological imbalances by eating as healthy as possible, and seek proffessional help.